This hand-painted collection features bold butterflies and cute flowers that pop on a pink and white color palette. Adult assembly required. Ages 2+. 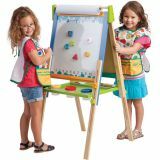 11.5″ Dia x 19″H. 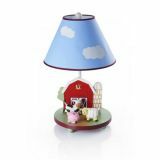 The Farm Friends table lamp sheds light on the barnyard and its hand-painted, resin characters. The friendly bluebird soars above the cute cow, plump pig, and little lamb on a cloth shade. The neutral palette of the Farm Friends table lamp suits boy and girls alike and will be an impressive piece for any bedroom or playroom! 11.5″Dia. x 19″H. 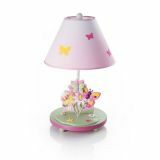 The Gleeful Bugs table lamp is comprised of sweet butterflies, flowers and bumbling bugs in a patchwork-style design to coordinate with girls' pastel bedding and decor. 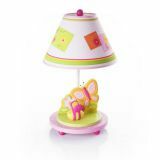 Gleeful Bugs impressively showcases hand-painted flower designs and a chunky, resin bumble bee under an adorable polka-dotted lamp shade. Adult assembly required. 11.5″Dia. x 19″H. 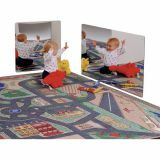 Put a smile on a baby's face with this distortion free acrylic mirror. 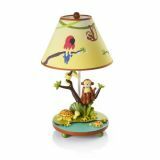 The Jungle Party table lamp encapsulates a range of jungle animals from turtles swimming to monkeys swinging through the canopy. The artfully crafted and hand-painted base includes a monkey on a tree bough, a pleasant python, and two turtles. 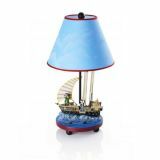 Turn on the fun for any bedroom or playroom with the scenic, cloth lamp shade, which includes a perched parrot. Adult assembly required. 11.5″Dia. x 19″H. 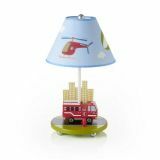 The illustrative scenes of chugging trains, adorable automobiles, and bustling air traffic with hand-painted elements encompass a classic appeal that is perfect for a first-room or playroom. The muted, blue palette is the perfect match to many room decor and bedding collections. Adult assembly required. Ages 2+. 11.5″ Diameter x 19″H. 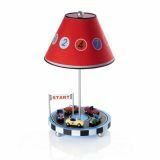 Hand-painted cars sit on a spinning dolly; spin the base and watch the retro racers cross the finish line. Resin sculpted cars and cloth shade. 13″Diameter x 18″H. 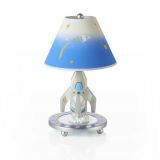 Illuminate the final frontier with this space-themed tabletop lamp. Featuring a handsome blue and white fabric shade with outer-space elements over a hand-painted resin rocket ship base, this is ideal for brightening any little explorer's bedroom or play space. Some assembly required. 11.5″Dia x 19″H. All aboard for a nautical adventure with the Sailing furniture set! This collection features shades of sea, sky, and sandy beaches–decorated with images of cheerful crabs, diving dolphins, soaring seagulls, and sailboats at full mast. 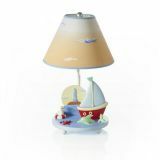 This tabletop lamp features a cloth sunset shade over a peaceful maritime resin tableau–a dolphin, crab and seagull frolic near a sailboat while a lighthouse looks on in the background. 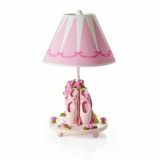 Illuminate a child's bedroom or playroom with this beautiful, hand-painted lamp. Some assembly required. 11.5″Dia. x 19″H.